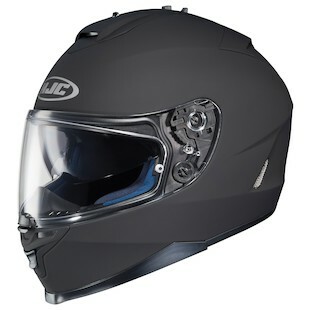 HJC IS-17 Helmet: Adding to the IS-16, one step at a time! While they can't claim creativity on the name, HJC can certainly claim a well-thought design on the latest replacement to their IS-16 model. Three guesses as to the successor's title and the first two don't count! You got it, the HJC IS-17 Helmet is a worthy shell to update the outdated IS-16. You'll notice right away that the shell and vent scheme has been re-worked for a cleaner, smoother exterior. The faceshield has also been updated with their most current design, one that is a breeze to use, both in removal and features the new center shield lock mechanism. Perfect for the light touring, or sport touring crowd, the IS-17 includes a drop-down sunvisor and a moisture wicking, anti-microbial interior. The solid colors will appear in Black, Matte Black, and White, while more intriguing color options will be available, like the Intake Hi-Viz pictures here. 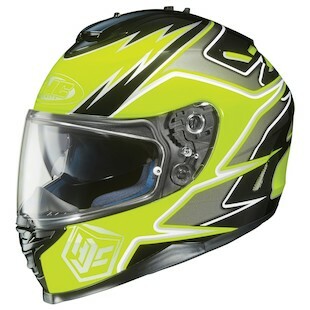 For a full break down of all of the HJC IS-17 Helmets, head over to RevZilla.com!